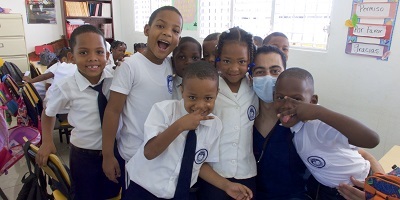 In Fall 2017, Stony Brook School of Dental Medicine (SDM) participated in its inaugural global outreach mission to La Romana, a city on the Dominican Republic. The outreach mission was organized by World of Smiles Inc., and its chairman, Dr. James Hudson, with assistance from Dr. Ira Lamster, Clinical Professor and Director of SDM Global Oral Health Programs. Fourth year dental students Omar Nijem, Igor Lantsberg, Samir Lillaney, and Houssam El Hassan were selected to attend the outreach mission. In addition to the SDM students, the mission was attended by Dr. Hudson and seven supporting dental professionals, from the New York Academy of Dentistry (NYAD), with expertise in restorative dentistry, oral maxillofacial surgery, and endodontics. Over 500 patients, all children from the schools of Fundación Mission International Rescue (MIR) within poverty-stricken areas, were provided with comprehensive care during the nearly week-long outreach mission. The clinic, established by World of Smiles Inc., is a six chair dental clinic located on the site of Fundación MIR. In 2016, a year-round, local clinic director was added to conduct continuous oral health screenings and ensure comprehensive ongoing services would be available. “It was clear that the dentists from the NYAD put in a lot of effort and pride into providing these services and ensuring their facilities were in pristine condition,” explained Igor Lantsberg. Each SDM student performed numerous screenings and various procedures, ranging from the application of fluoride preventive agents to the extraction of non-restorable teeth. Of his interaction with patients, Lantsberg said, “Everyone accepted us without hesitation and their joy was contagious.” Omar Nijem reflected on his most memorable interaction with a patient: performing a class IV composite repair on an anterior tooth. Nijem anticipates that the patient, who was shy upon their meeting, will find additional confidence from his new smile. According to Samir Lillaney, the outreach mission was an amazing and memorable experience. “We were all excited to spread our knowledge and experience that we have gained and to provide care to those in need in the Dominican Republic.” In addition to furthering their clinical experience, SDM students received exposure to a different society, gaining language and cultural experiences. Dr. Hudson explained that the ultimate goal of World of Smiles Inc. is prevention, and his hope for the future is to collaborate continuously with SDM, and with local schools in the Dominican Republic, to bring to life a full preventative program. “The outreach supports the ethical obligation of a professional to support efforts to provide for those who cannot provide for themselves,” said Dr. Hudson. This thought mirrors the values of SDM and its commitment to providing care to the underserved. The next SDM outreach mission to the Dominican Republic is tentatively scheduled for fall of 2018.